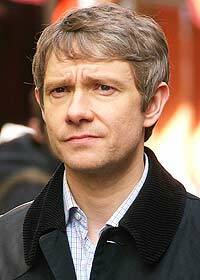 An English actor who is known for his roles as Bilbo Baggins in Peter Jackson's The Hobbit, Doctor Watson in the BBC's Sherlock and Tim in The Office. Mycroft Holmes:"You don't seem very afraid." Doctor John Watson:"You don't seem very frightening." Doctor John Watson:"A cup of tea would be lovely, thank you." Mrs. Hudson:"Just this once dear. I'm not your housekeeper." Doctor John Watson:"A couple of biscuits too, if you got them." Doctor John Watson:"You know, I've got a phone. Very clever and all that, but uh, you could just phone me, on my phone." Mr. Prosser:"Mister Dent, have you have any idea how much damage this bulldozer would suffer if I just let it just roll straight over you?" Arthur Dent:"Well I think I should tell you that I do not date single cell organisms." Marvin:"I've been talking to the ship's computer." Arthur Dent:"If I asked where we were, would I regret it?" Gandalf:"I'm looking for someone to share in an adventure." Bilbo Baggins:"An adventure? Now I don't imagine anyone west of Bree would have much interest in adventures. Nasty, disturbing, uncomfortable things that make you late for dinner." Bilbo Baggins:"Excuse me! That is a doily, not a dish cloth!" Bofur:"But it's full of holes." Bilbo Baggins:"It's supposed to look like that. It's crochet." Bofur:"Oh and a wonderful game it is too. If you've got the balls for it." Bilbo Baggins:"I know you doubt me and I know you always have. And you're right, I often think of Bag End. I miss my books and my armchair and my garden. You see, that's where I belong. That's home. And that's why I came back, because you don't have one. A home. It was taken from you, but I will help you take it back if I can." Gandalf:"What do you mean? Do you mean to wish me a good morning, or do you mean that it is a good morning whether I want it or not. Or perhaps you mean to say that you feel good on this particular morning. Or are you simply stating that it is a morning to be good on?" Bilbo Baggins:"All of them at once, I suppose." Balin:"I wouldn't bother, laddie. Swords are named for the great deeds they do in war." Bilbo Baggins:"What are you saying, my sword hasn't seen battle?" Balin:"Not actually sure it is a sword. More of a letter opener, really." Bilbo Baggins: "What have we done?" Bilbo Baggins: "Sting? That's a good name. Sting."